This is a quick blog I wrote in the summer, but for reasons described below I haven’t got round to posting! Enjoy! It’s been quite a while since I’ve managed to get out and wet a line. New family members have the ability to eat up all your time doing all the fun stuff that young families do. It’s been and will continue to be a huge roller coaster. I’ve only managed a very early morning session at Lyme Regis, blanked and was home before 9am. Anyway…. the weather over the last week has been one of almost constant and blistering sunshine and I had been told that the mackerel had arrived on the south coast. My wife and I had agreed to visit West Bay for a few hours on Sunday morning, and I would be taking a box of lures and some feathers. Arriving at West Bay and feeling the solid 20-25mph wind meant that the aquamarine blue sea had chopped up and was (although still blue) quite cloudy. There would be no mackerel fishing today. I quickly rethought my options and elected to the ledger float method. A quick trip to West Bay Angling to pick up some ragworm and a float and I was away. I had set up my rig and was very pleased to see my wife walking up the pier with my son and a breakfast roll! What a result! I could see a lot of small fish moving in the top few inches of water, but despite fishing shallow I didn’t get a bite for the half an hour. The bites only started consistently when I plumbed the depth and shortened the hook length down to 6 inches. The wind was getting stronger but fortunately some of the anglers to my right had decided to move off. We all moved up the breakwater and managed to find shelter from the wind behind a low wall. I dropped my bait in close to the structure and began to wait. The float bobbed up and down, and after a few minutes it disappeared. I was in to a fish! On my son’s first fishing outing (although he almost certainly had no idea what was going on…)! 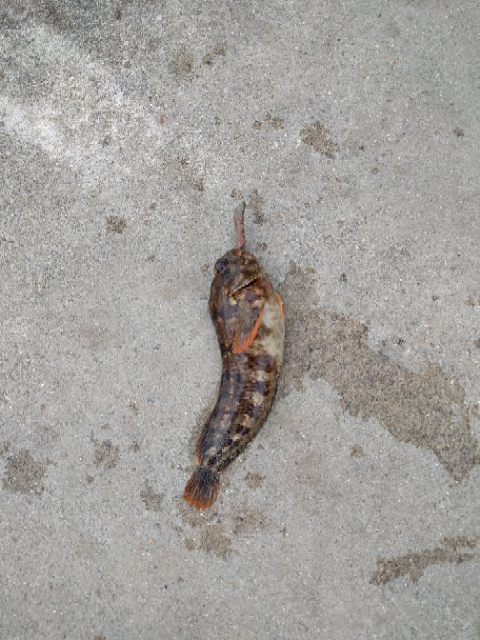 It was a large Goby! I unhooked it and dropped it back into the water where it promptly vanished back down into the depths. I fished for another 45 minutes but the tide had really started to turn and the ebb meant constantly adjusting my rig depth and moving my float back into the position I wanted it to be in. Still I can’t complain! It wasn’t a blank. As we packed up I said to my wife “I’ve still got it…”. It was a nice activity for a few hours and I cannot wait until my son is a bit older so I can take him out to properly and catch a few bigger fish, but until then we’ll just enjoy the family time together. Thanks Sam! Fishing has taken a slight hiatus, but I'm aiming to get out a couple of times over winter, but the little one definitely keeps us on our toes! Next story Trip #98 – Catch it, Kill it, Eat it!